I have a very dear friend in Northern Italy who urged me to cook this famous dish and so last week, I finally gathered all of the ingredients (some even from my veggie garden) and prepared it for myself & my daughter. It was a hit! My daughter loves eggplant and she now has a new favorite recipe. Pasta alla Norma is a hugely popular classic Catania Sicilian dish that was so loved that it was named after a 19th century opera, ‘Norma,’ written by Sicilian composer Bellini. It is made with simple, yet tasty ingredients: sliced & sauteed eggplant in extra virgin olive oil, tomatoes, fresh basil, penne pasta and ricotta salata cheese. (I couldn’t resist adding garlic to the mix.) I was unable to find the ricotta salata cheese here, but I have been told one can use fresh ricotta or even sliced parmigiano or as I did, use mozzarella. 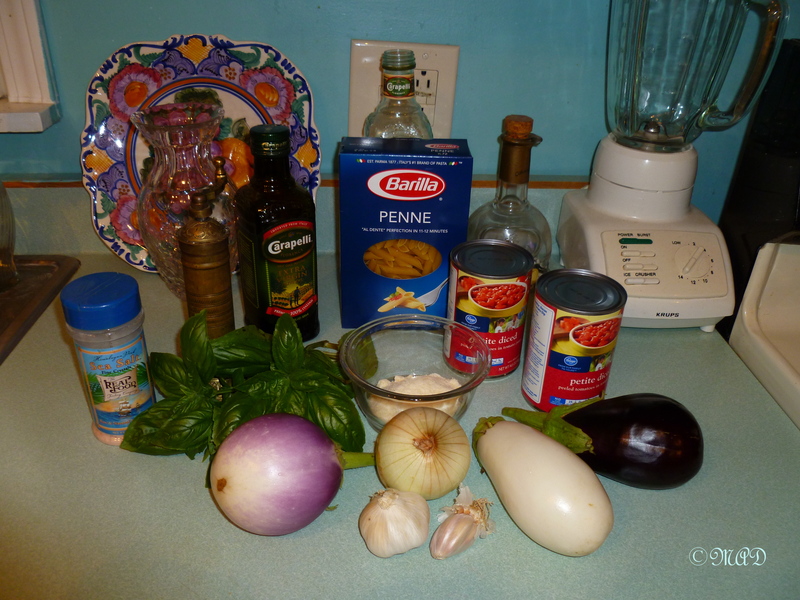 Boil in water, the penne pasta and drain, setting aside for when the tomato-eggplant mixture is finished. 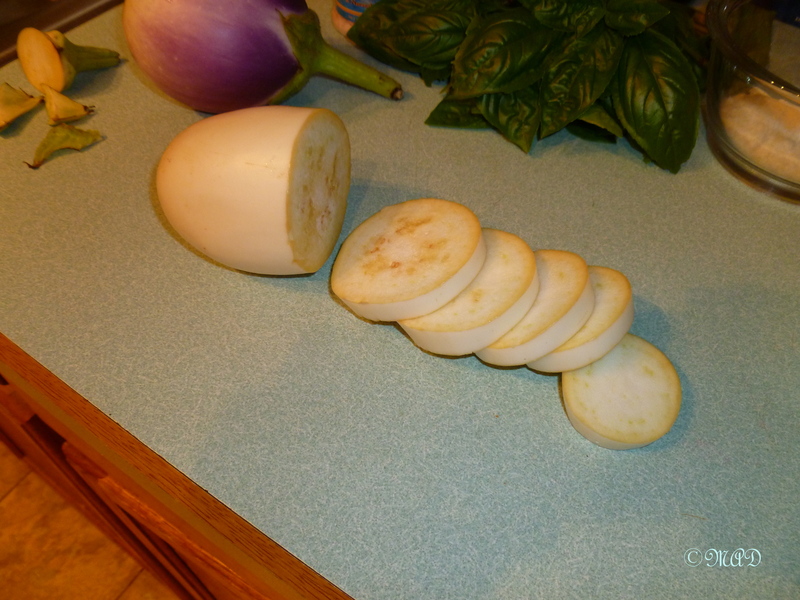 Start first by preparing the eggplant, depending on what variety you use, you may need to slice it and sprinkle with salt, let it sit at least an hour and then rinse before sauteeing. I planted a seed packet of a mix of colors and I found the white ones or pink mottled ones are very mild in flavor and don’t have that bitter taste like the darker aubergine ones. 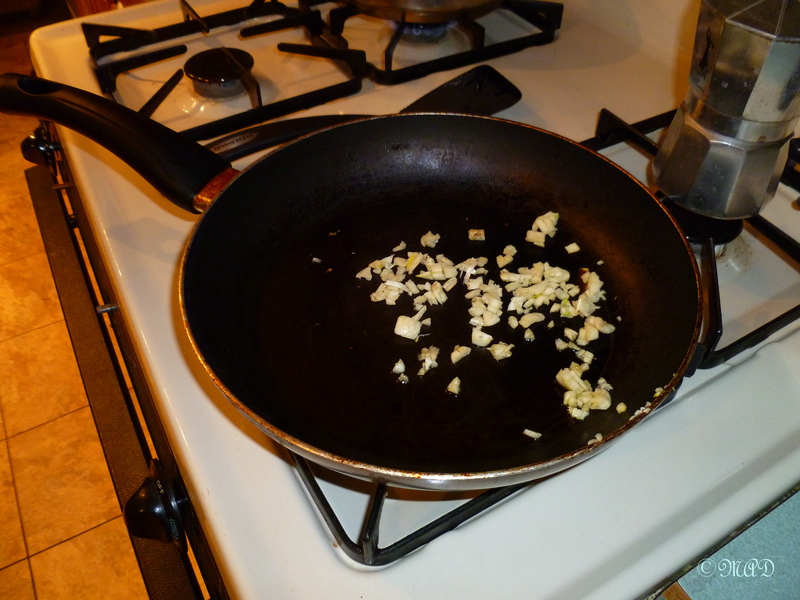 Because I added garlic, I sauteed the garlic first in a little bit of extra virgin olive oil. If you add onions, sautee them at this time. 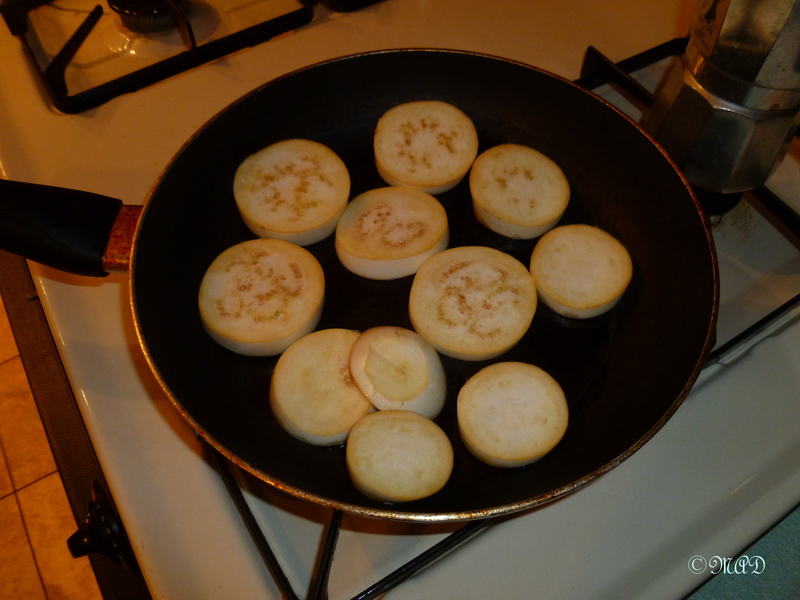 Sautee the slices in a little extra virgin olive oil on both sides. One can also prepare these on the grill – I would brush them with olive oil before placing on the grill. Then, to the sauteed mixture, add a handful of fresh basil leaves and stir to cook. 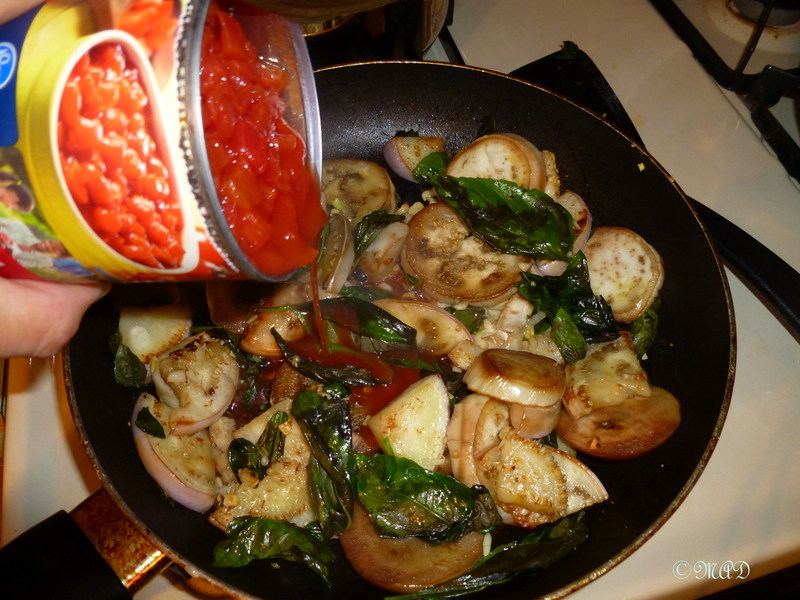 Add two cans of diced Italian tomatoes to the pan.. Stir until heated and cooked thoroughly. To present the dish, either on a plate or a serving bowl, arrange the penne pasta first and then cover with the tomato-eggplant mixture. Grate or slice onto the top, the ricotta salata cheese and serve with a fresh salad (insalata mista) and sliced Italian bread. 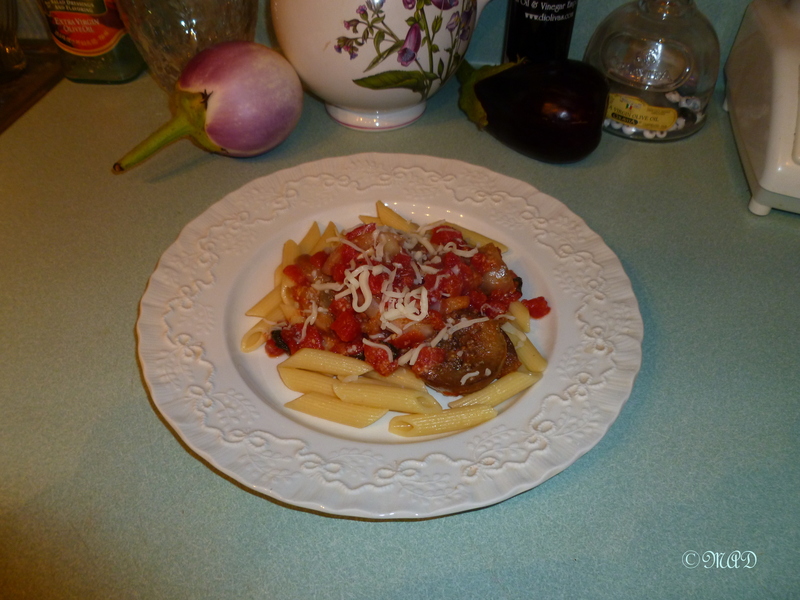 This entry was posted in Italian Cooking and tagged basil, basil leaves, Bellini, Catania, dinner, eggplant, extra virgin olive oil, food, fresh basil, garlic, Norma, onions, parmigiana, pasta, Pasta alla Norma, penne pasta, ricotta salata cheese, sauteed eggplant, sicilian dish, Sicily, vegetarian. Bookmark the permalink. Looks delicious and easy to make!